I am trying to get Riv to actually leave it on, because it's so cute! Thanks so much G & G Foscarini!! It is crazy to me that I was playing at this house when I was Riv's age and now he is! 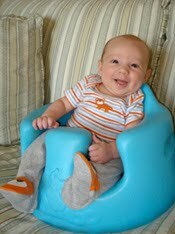 This blog has no other purpose then I had cute pics of Riv and had to share them :) Enjoy! Provo Canyon in the Fall! I have always felt so blessed..
to live just minutes from the Provo Canyon. In my opinion there is nowhere that can compare to the beauty found here! But he kept wanting to get in the River! This is going through the Alpine Loop. Pictures do not do it justice! We love our canyon and love visiting it often. I hope River will enjoy being so close to the canyon like I did growing up. Visiting while the leaves are changing is a must! Every time I go to the canyon I am in awe of the power God has to create such beauty. The crisp air and the smells of Fall are abundant this time of year. Go visit if you haven't had time yet, I promise you won't be disappointed! Riv didn't know quite what to make of everything and just wanted to be held. He was scared of most things including the Fire men! He got a Fire man's hat, but preferred when I wore it. He got to go in the back of an ambulance, spray a fire hose, and saw a life flight take off. He really didn't know what to think about this fire clown! We are so grateful for all that Fire fighters do for us! We are so glad that there are brave men and women to help keep us safe. Thanks for letting us come see all your cool toys and thanks for the hat, popcorn & cotton-candy! We are glad you are our neighbor (literally). I have been baking up every sweet thing you can think of! I always get in the mood for baking when Fall comes around. I have tried a lot of great recepies...these are homemade chocolate cupcakes with peanut-butter frosting. Yummy!